We can provide quality and affordable care in the comfort of your own home. Our personal care attendants are English speaking, reliable, fully screened, bonded, employees of our agency with both liability and workers compensation insurance coverage. Contact us to discuss our variety of homecare options for every need and budget. There’s no place like home! Differences between using a Home Care Agency vs. Bonding, liability & workers comp. insurance Our staff are bonded and insured, giving you peace of mind that if the caregiver hurt themselves in your home they would not sue your home owners insurance policy. Usually none. It’s your responsibility to investigate any insurance held by these individuals. Private individuals can sue your home owners insurance policy if hurt on the job. All cases are carefully monitored and supervised by our Geriatric Case Managers and our management team. Family members keptinformed on a regular basis. 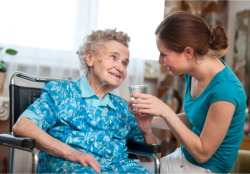 Flexibility of home care services Your home care service requirements will rarely stay the same. If the skill level or amount of care that you require increases or decreases, we can accommodate your needs. Skills are fixed to the particular individual, and you pay for the skills they can perform rather than the skills you need.